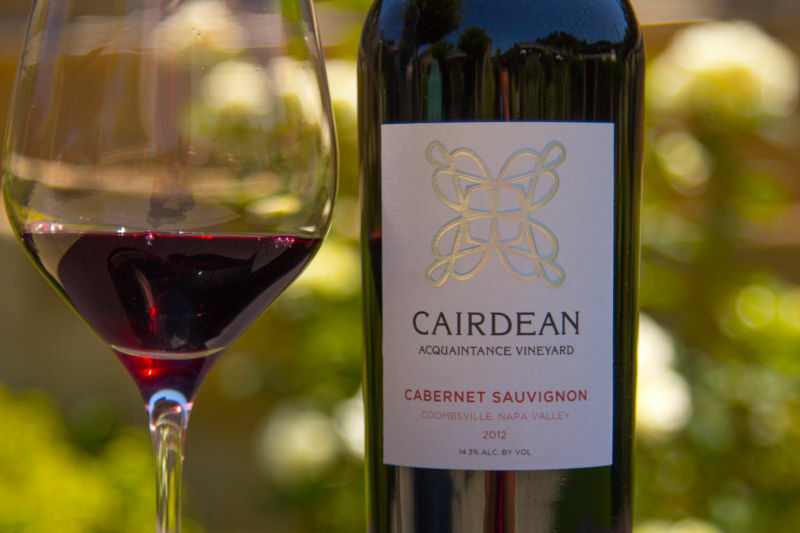 I had no real experience of Cairdean Estate Vineyards before my visit. I had come across some posts of theirs in my Twitter and Instagram feeds, but that is it. I was out for the day with a girlfriend and we stopped in on a whim while enjoying our day in St Helena. 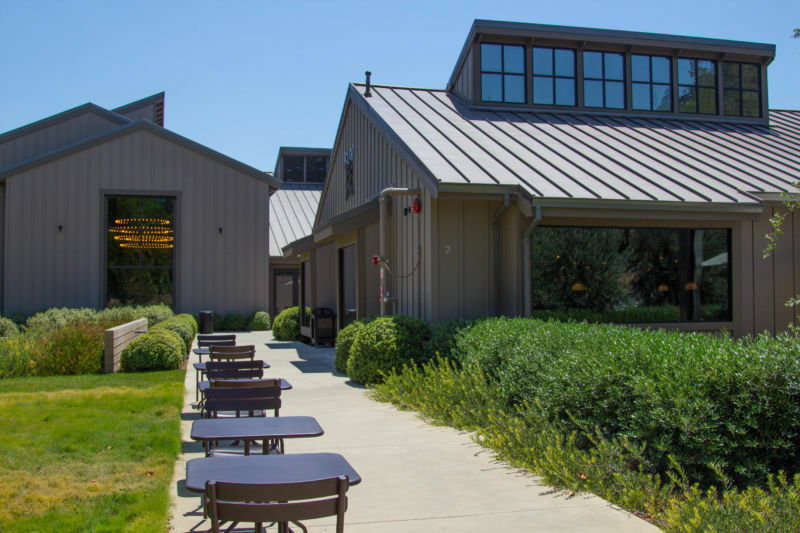 The tasting room is located right off St Helena Highway. When we pulled in to the parking lot, we weren’t exactly sure what it was: a tasting room, art gallery, event space, or restaurant. Apparently it is a little of each. At some point I will go back to visit the restaurant Brasswood Bar and Kitchen. The buildings are modern architecture and very attractive. There is lush landscaping and fountains for visitors to enjoy. 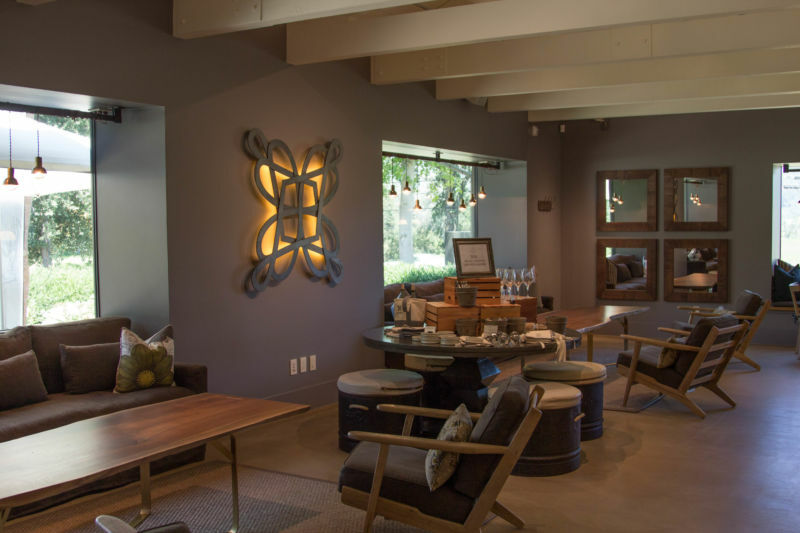 There is a restaurant and gallery on site, and a large beautiful tasting room. It seems as though there are event rooms and other spaces for rent. The tasting room itself was nice with warm brown walls, interesting architectural details and lovely decor featuring a large square bar in the center of the space. Like most tasting rooms they have wine accessories for sale, but they also have pieces of art and jewelry as well. 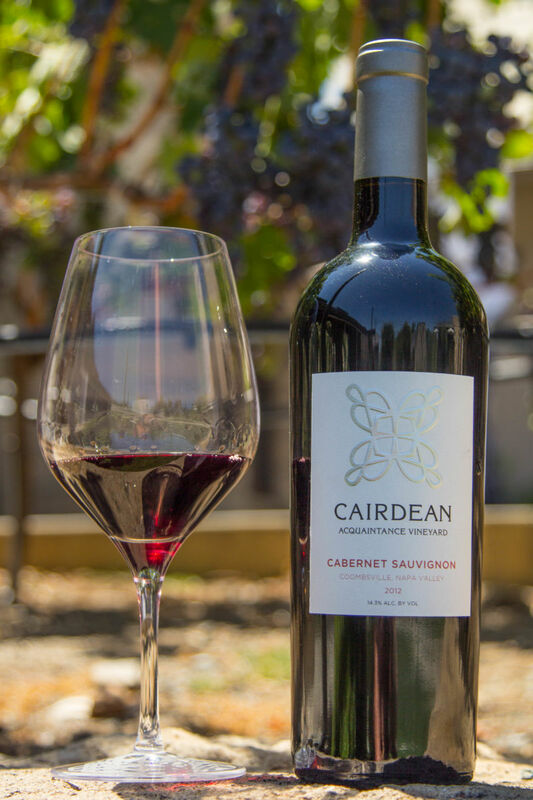 When chatting to the wine host Doug, we found out that Caridean Estate is in the process of re-branding their entire line up and are selling all of their current stock for 30-70% off the list price. All cases are 70% off. That makes some of their bottles around $7 each! Crazy price! The owners of the vineyards have decided to make fewer wines focusing their efforts and energy on only their best. Although I think their current packaging is quite attractive, I am all about getting a bargain. Hooray for re-branding! Right now they have a very large line up. From their website it looks like they have nineteen wines to choose from. They are planning to cut it down to only five. Apparently they have a new winemaker and the re-branding will reflect the new style of wine. I would like to personally highlight one of their bottles of wine as it is special to me. 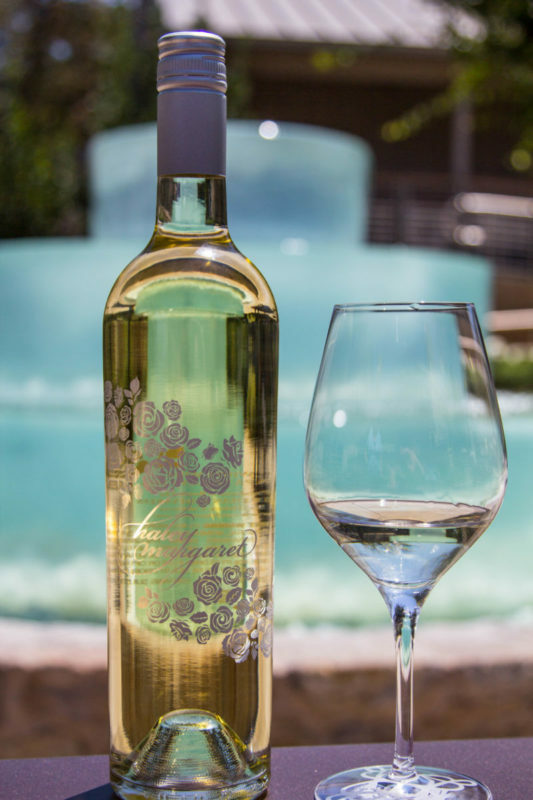 The 2014 Hayley Margret white blend. I am not highlighting it because the wine is particularly good, but what the wine represents. It was made in honor of the life of Hayley Margret Dowdell who died in 2012 from Cystic Fibrosis. CF is a horrible disease and it has touched the lives of people close to me. Part of the proceeds from the purchase of this white wine goes to the CF Foundation to help find a cure. I think that is something we can all get behind. The wine itself is has very bright acidity and strong floral notes. It is a blend of Pinot Gris and Roussanne. I would pair it with a dessert or something with a sweet profile as I think it would balance the flavors beautifully. As for what I thought was good from their current line up, I bought a bottle of the 2012 Cab Franc from the Acquaintance Vineyard ($84). It was a nicely balanced wine with dark summer fruits on the palate. Flavors of strawberry with a hint of leather and smoke are what is left in the mouth at the finish. I wouldn’t pay $84 for it, but it is a nice wine @70% off. The 2013 Chardonnay ($46) had the smell of canned tuna on the nose. The flavor on the palate was of oak and butter with a long quite acidic finish. If you like oak/buttery chardonnay, this one may be for you. 2014 Unoaked Chardonnay ($34) was a far nicer expression of the grape in my opinion. Soft fruits on the palate with a slightly bitter finish. It had a smokey nose and nice structure. 2012 Sangiovese ($45) Smelled of spices, black pepper and cedar. On the palate, it was dry with few fruits and an overwhelming flavor of woodland. This was not my favorite sip. I far prefer what is on offer at Luna Vineyards. 2011 Cab Franc ($84) was both Tannic and Woodsy on the nose and palate with a bitter finish. You can tell that this winemaker has a certain style, preferring to incorporate lots of wood and smoke in his wines. All of the fruit is lost. 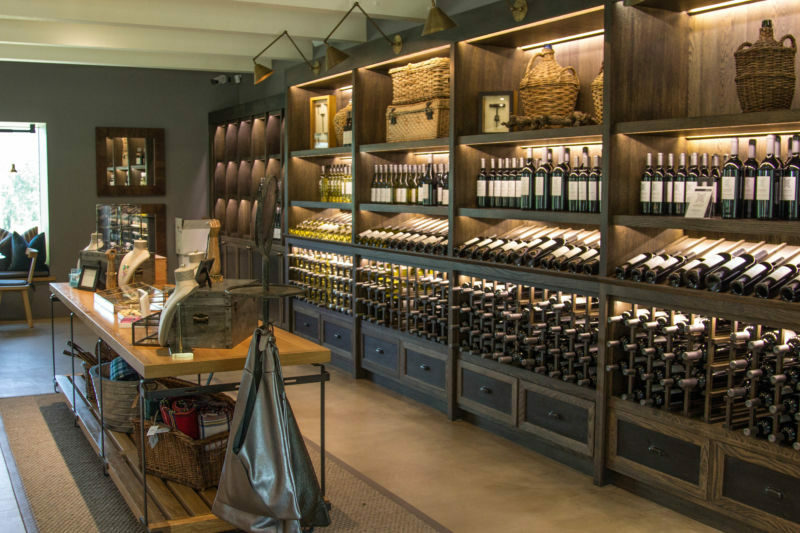 I am looking forward to visiting the tasting room again after their re-branding has been completed. Remember that the prices that I have quoted is before the sale price and the more you buy the more you save.